This is by Ros Todhunter, a geologist from Lostock Green. The proposed high speed rail route has been drawn straight through an area vital to the nation’s economy, with a huge negative impact. Coming out of the tunnel under Crewe the proposed high speed rail route is directly above the active Salt Mine which is at shallow depths between Winsford and Middlewich. The HS2 route narrowly skirts the existing Storngy Natural Gas Storage and the proposed Keuper Gas Storage Project between Whatcroft and Byley and then goes straight across the area of King Street Energy’s proposed development of strategic natural gas storage, east of King Street between Morrisons and Penny’s Lane, Lach Dennis. This project has been put on hold since the announcement of the HS2 route. It’s worth noting Britain has only 2 weeks maybe 3 weeks of strategic natural gas storage if our overseas gas suppliers decide to turn the taps off even without an exceptionally cold winter. Having sterilised some of the UK’s potential strategic natural gas storage the HS2 proposed route then heads over the working Holford Brine field where salt is dissolved and pumped out of brine wells that occur every 500m between Lach Dennis around Lostock Green and up to the the A556 at the Lostock Triangle. In the same area the HS2 proposed route crosses an intricate network of interconnecting pipework of pressurised brine, fresh water and air which transport the brine as feedstock for the chemical industries of Northwich, Winnington, Runcorn Widnes and beyond. 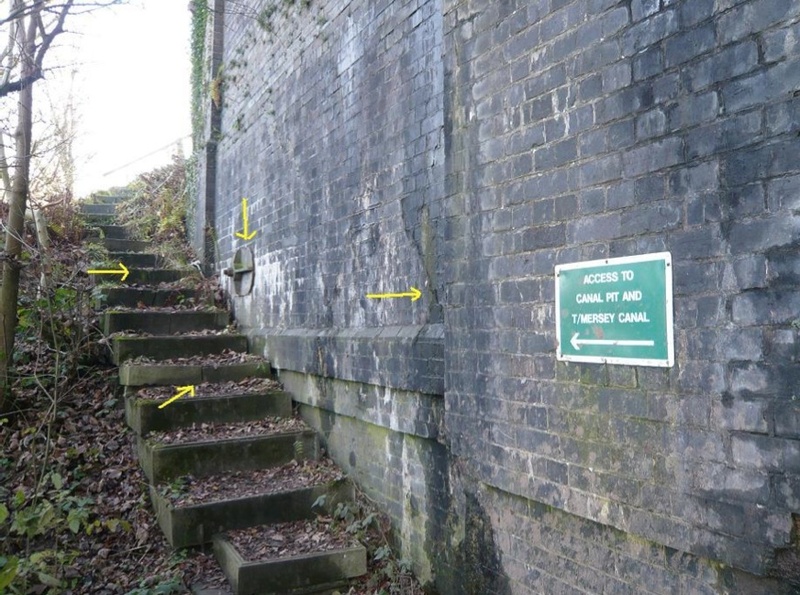 There are questions about the suitability and safety aspects of siting a rail line that only tolerates ground movements of less than 5mm through an area of know salt extraction and subsidence. HS2 is on shaky ground in the Cheshire. For centuries the ground surface has been on the move and still is due to natural and industry generated salt solution. 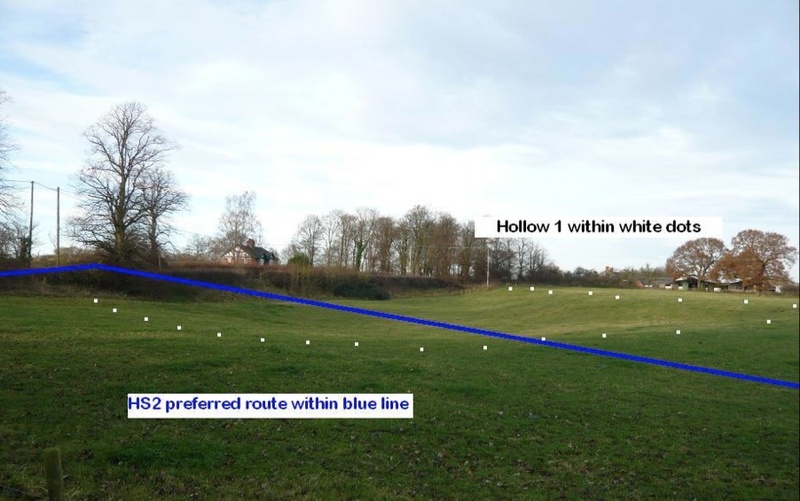 In Wimboldsley, an area of former wild brine pumping between and Winsford and Middlewich, the HS2 proposed route has been drawn right down the centre of one of many linear hollows of up to 2m deep that are still subsiding. The ground is on the move also at Greenheyes Farm in Stanthorne, NW of Middlewich, where the line of the HS2 route has been drawn through, over or is it in a 4m deep subsidence hollow as shown in the photo above. Further up the route of HS2 the line crosses the river Dane and the Trent and Mersey canal and their associated salt subsidence flashes well known to local anglers and those who regularly inspect the cracks in the mineral line rail bridge at Whatcroft which is held together by steel ties due to damage by salt solution ground movement. Here’s a photo. not accept this HS2 route as a credible approach to the inward investment project HS2 as currently planned.